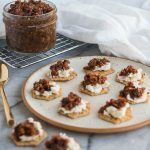 Sweet and salty bacon jam requires minimal effort, and returns a delicious topping or spread which can be used on a variety of other foods! Paired with crackers and goat cheese here, they’re a simple, perfect snack or appetizer. In a frying pan over medium-high heat, cook the bacon until very done and crispy, but not burnt. Remove the bacon from the pan, but leave the fat and reduce the heat to medium. Add the onion and cook for 3 minutes before adding the garlic and jalapeños. Once the jalapenos begin to soften (another 3 minutes or so), remove everything from the pan and put in a saucepan along with the cooked bacon, brown sugar, maple syrup, apple cider vinegar, bay leaf, and 1 cup of water. After 3-4 hours, it should look sticky/jammy. Reduce the water so there’s only about 1/4 cup left, then add the pepper and transfer everything to a food processor. Pulse a few times, so there are still small chunks but it comes together like a jam. Taste, add more salt or pepper if needed, and serve with goat cheese and Crunchmaster Multi-Seed Crackers (I used Original flavor). *Roughly. Keep an eye on it — it should never go dry, but never be totally swimming in water.